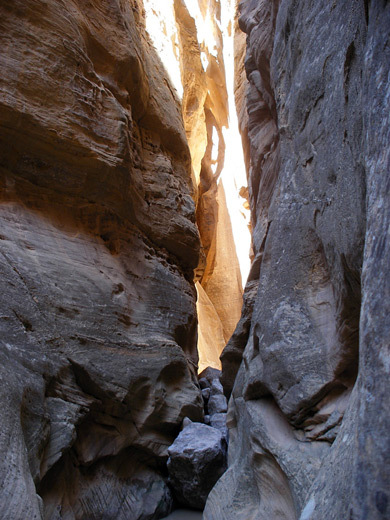 Although the Colorado Plateau stretches for over 500 miles and spans four states, most of its well known slot canyons are concentrated in the center, in south Utah. But other areas also have good slots, such as the remote, inhospitable country around the confluence of the Green and Yampa rivers in northwest Colorado, near the Utah border - much of which is part of Dinosaur National Monument. Canyons here tend to be steep, blocked at intervals by unclimbable dryfalls and also difficult to access, but one drainage within reach of a day hike is Buckwater Draw, the upper two forks of which have various short but elegant narrow sections, while the main gorge is also deep and enclosed for about a third of a mile. Hikers can see most of the best parts of the canyon via 6 miles of fairly strenuous cross-country walking, taking 4 hours or so. TopoQuest topographic map of Buckwater Draw. Parking for the hike is at the Plug Hat Rock picnic area, a sheltered location on the edge of a plateau 4.3 miles from state route 40 along Harpers Corner Road, which leads to the eastern portion of Dinosaur National Monument. The secluded setting, out-of-sight of the highway, may tempt some to camp overnight, but this is not allowed and the place is likely to be patrolled by the NPS; the nearest good location for free camping is 7.5 miles north, along the unpaved Blue Mountain Road. 13 views of Buckwater Draw. The plateau rim at the picnic area looks out westwards over a big area of canyons and cliffs, with flat lands around Jensen and the Green River stretching out beyond. 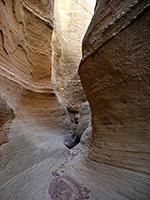 Directly below is Bull Canyon, fairly deep but lacking any narrows; Buckwater is the next drainage north, one mile away, and the upper part of the south (lower) fork may be reached by first walking from the carpark towards the rim, over a fence and along the cliff edge northwards for 0.75 miles, veering west to the end of a promontory. The land falls away vertically at some points but there are several climb-down routes, one on the north side quite close to the western tip. Buckwater Draw is bordered on the far side by high white-yellow buttes of Entrada sandstone, becoming more sheer downstream, though the ground on the near side is much less steep. 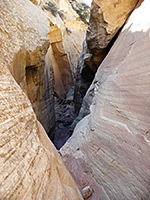 The canyon is reached by scrambling down the overgrown slopes beneath the promontory, and it has about half a dozen short slot passageways mixed with shallower, V-shaped sections. All the slots contain dryfalls at the start or in the middle; some just a couple of feet high and easily passed, others more difficult to overcome. The surrounding rock is clean and light-colored, formed of thin, angular strata and eroded into smooth, undulating curves. Even the deepest parts of the ravine remain bright and often sunlit, as the cliffs are straight and do not overhang above. 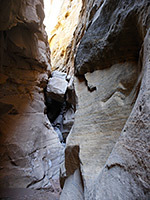 The final enclosed section, soon before the junction with the north (main) fork has the tallest dryfall (20 feet), so is not descendable unless using ropes, but the passages before are the best of the south fork; deep, a little darker, and containing pools, chokestones and slippery mud. 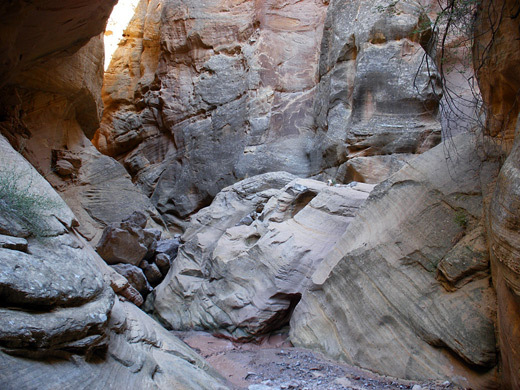 To see the lower gorge without rappelling needs quite a long diversion; back a short way, up the south side of the canyon then westwards along the bushy rim, past the junction of the two forks, where the ravine is rather deeper (300 feet) and vertical-walled. The first re-entry point is not until after half a mile, via another steep, overgrown slope, across patches of soft sand and loose rocks. The floor of this part of the canyon is quite wide, and the valley opens out completely not far downstream, as the wash winds over flat land towards Cliff Creek and the Green River. Turning right (upstream), the canyon closes in after a short walk along the sandy, bouldery creekbed. The walls become sheer though far enough apart still for bushes and trees to grow, until the passage narrows further to a channel with a few minor pools and falls, and one larger drop of ten feet beneath a chokestone, which is rather difficult to climb over. The canyon splits not far beyond, both branches leading to a deep, enclosed chamber beneath a higher drop of 100 feet (north) or 15 feet (south), and so putting an end to further exploration. 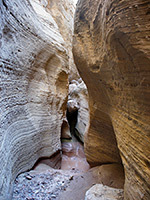 Overall, the amount of canyon that can be seen without use of ropes is somewhat limited, but the passages are pretty and the whole area is pristine and very little visited. The off-trail hiking is a little more difficult than some locations owing to the steep slopes, covered with trees and spiky bushes.